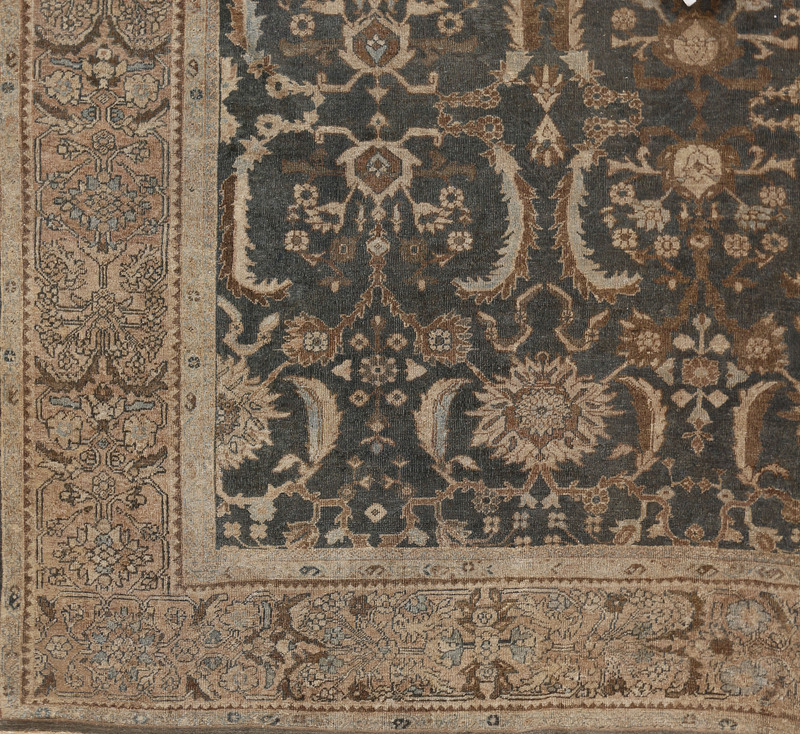 This is a most unusual Sultanabad carpet from northwest Persia. First, the field is a rich, deep slate, verging on charcoal. Next, there are really two field patterns, seemingly employed almost randomly.The seven horizontal echelons divide into two styles: elaborate rosette-palmettes with attendant cloudbands and flanking lancet leaves, in the first, fifth and sixth rows; and the second, third, fourth and seventh rows with giant curved leaves around small palmettes emitting various flower stems. The effect is a stop/start, the weavers unable to make up their minds and settle on a single pattern. 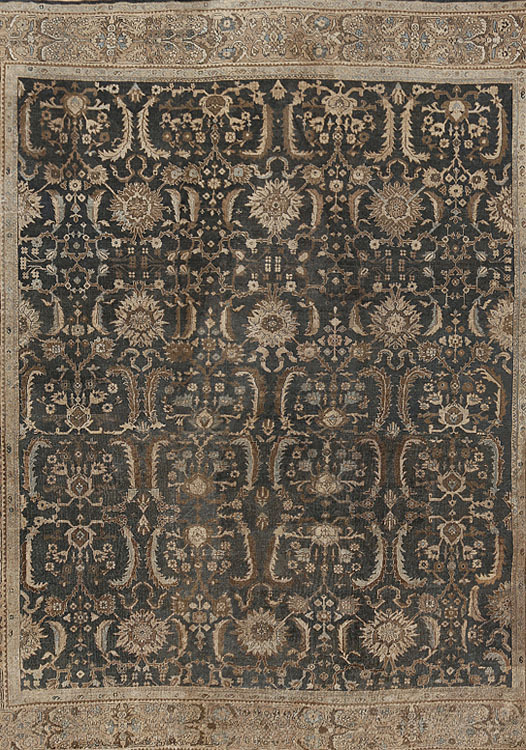 This makes such a large carpet totally idiosyncratic and individual. 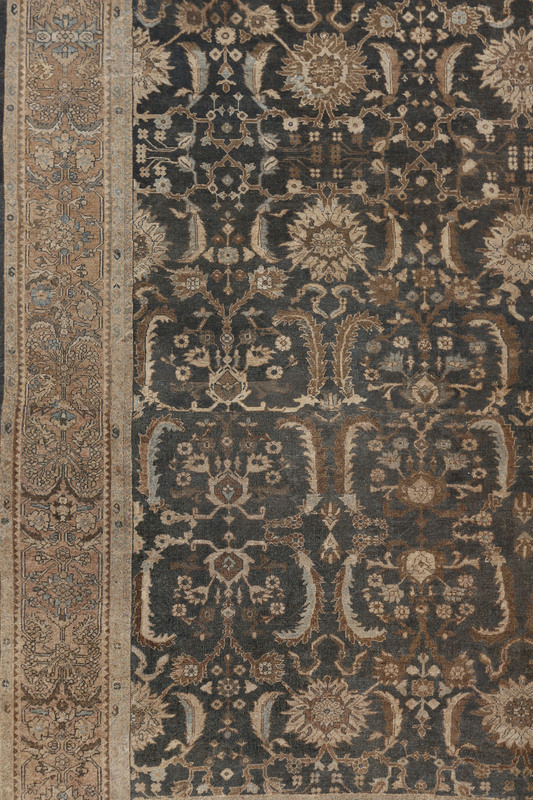 The rows with huge leaves are neatly bounded by the border, while those with large palmettes pass underneath.The weavers could have been working with two distinct pattern samplers. The tan main border continues the curved leaf motif, but on a smaller scale. The palette is decorative in an unusual way: slate-charcoal, warm brown, light grey, tan, touches of lighter blues. The pattern is overscaled and the extremely rich tonality sets off light colored furniture. 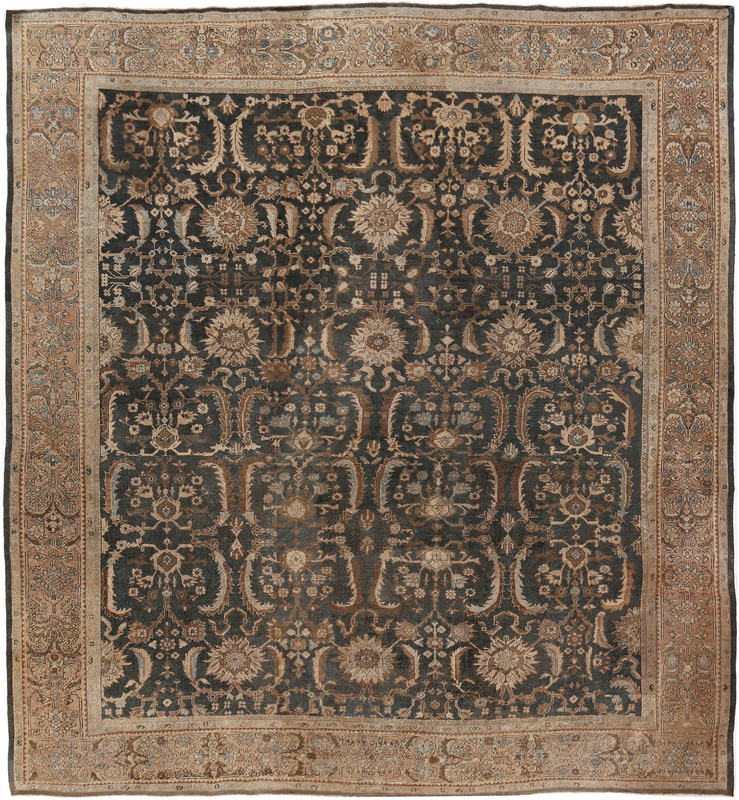 Most Sultanabad carpets of this period have generally light palettes in allover patterns. The colors are ivory, light blue, rust, light green, sometimes dark blue. The deep ground color gives it a warm and cozy feeling, even though it is of a size that could overwhelm its surroundings. In fact, the charcoal background is recessive and embracing. The condition is desirably distressed.